The city is considering alternatives for the Fourmile Creek path in the vicinity of 19th and Upland near Crest View Elementary School (see project map here). The staff recommendation is to put the multi-use path along the creek right of way. This alternative is not only best for flood mitigation, but is the only alternative that provides safe separation between cars and people walking or biking. The paved path would be maintained by the City of Boulder to a transportation standard. It would be plowed in the winter, providing safe, separated, year-round access for school children and bicycle commuters, thereby meeting goals of promoting walking and bicycling for both the Boulder Valley School District and the city. The completed path will ultimately be a part of a continuous Fourmile Creek path running from the Diagonal Highway almost to Lee Hill Road, providing safe access to the foothills trails. Compared to the rest of the city, north Boulder is sorely lacking in a long, continuous, multi-use path for recreation and commuting. Nearby landowners have objected to this path. 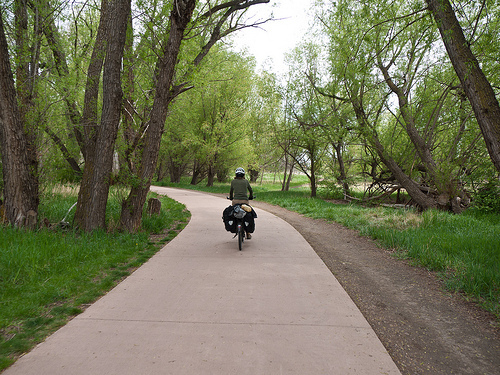 If we want to see a safe, continuous Fourmile Creek path in north Boulder, interested cyclists, walkers, Crest View parents and students should attend the Public Hearing at the Greenways Advisory Committee Meeting at 7 p.m. on Wednesday, Feb. 15 at the Municipal Building lobby, 1777 Broadway, to show support for the staff recommendation of a paved, multi-use path along the creek right of way. Public comments will be at the beginning of the meeting. Please plan to attend and let your voice be heard! And forward this notice to others who might be interested. Previous Topic: Atlantic Cities | Should Cities of the Future Look More to the Past?